'The only time I saw you try to throw a stone, Julia, it went over your shoulder behind you,' said Mrs Savernack. 'Then I shall stand with my back towards the Germans,'said Lady B comfortably. 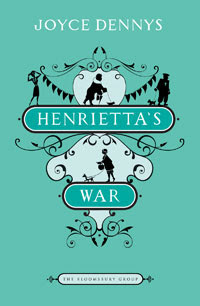 Henrietta's War is a fascinating book written in epistolary form. The main character Henrietta is based on the author herself. Joyce Dennys created the character of Henrietta for an article for Sketch. The article took the format of letter's written by Henrietta to her childhood friend Robert, who is away fighting in the war. The article was an instant success and Dennys was asked for more. Her fictional letters then became a regular feature in Sketch until the end of the war. The book only came about after Dennys found a bundle of cuttings during her later years in life whilst spring cleaning her house. The cuttings were her articles from Sketch. After reading them with a friend, she was reminded of what life used to be like during the war and her friend encouraged her to have them printed. And here in my hands, is the book that came to be. This is a delightful book that had me giggling every few pages. The antics of the villagers in this little village in Devon are hilarious. Each character more eccentric than the last. You cannot help but love them all and feel a little disappointed when you reach the last page. This gives you a real insight into how quieter parts of the country like Devon coped during the war. There is a real sense of community amongst the villagers as they come together to do their bit for the war effort. It made me nostalgic for a period of time I never knew. Denny's main character Henrietta is wonderful. You can feel her fear mixed in with her bravery. She struggled through the difficult times, scared of what might happen, jumping at every loud noise. She is real and very believable. I could see elements of myself within her character, as she tries to put on a brave face yet feels scared out of her wits at every change that occurs through out the war. This is a wonderfully charming little book that shows the lighter side of war. It doesn't dwell on the dark times, the unfortunate deaths and hardship that occurred. It looks more at community and making the most of what they had. I often wonder during our times of gluttony and instant gratification, how we would survive if this situation arose again. Would be learn to make do, after growing up in a era of want being seen as need. If you enjoyed books such as The Guernsey Literary and Potato Peel Pie Society and 84 Charring Cross Road, then you will love this book. It has also been likened to The Diary of a Provincial Lady, but as I have never read it, I couldn't possibly comment. There is a followup to this book called 'Henrietta Sees It Through,' which has recently been republished by The Bloomsbury Group. It continues with the letters through the war and I for one, can't wait to read it. I loved this book! I'm so glad you did too. You should definitely read The Diary of a Provincial Lady, Vivienne. There's no way you wouldn't enjoy it. As for me, I need to read Guernsey. I must admit that this does sound lke a very funny book. I can just picture those feisty elderly woman lining u on the beach, stones in hand. This sounds lovely, Vivienne. Adding it to my TBR list, thanks! This book has been on my wishlist for far too long! I loved both Guernsey and 84 Charing Cross Road... need to make more of an effort to obtain Henrietta's War!! Petty Witter - it was hilarious. Mary - it was lovely. JoAnn- I would definitely recommend this book. This book has been on my radar for a while, but your great review just made me add it to my wish list. It does sound delightful and I sure loved the Pie book. This book sounds really good and I loooved Guernsey so now I really want to read this, too. I've never heard of this one Viv - it sounds great. Yet another to add to the list. I'll need another lifetime to get all my reading done. lol. This sounds a lot like Guernsey Literary which I've read great things about. I'm definitely adding this to my tbr pile. Thanks for the wonderful review! I think I would like this book. The reviews have been very good. I loved Guernsey and 84 Charing Cross Road, so I'm adding this one to my wish list. I'm wondering how I've missed it up until now. This does sound very good. After your review I'll have to add it to my wish list.